This is the next in an occasional series of posts originating from ‘The Musicians’ Union: A Social History’ – an AHRC and ESRC funded research project based in the School of Culture and Creative Arts at the University of Glasgow. You can find about more about the project, and the history of the Musicians’ Union here. Dr. John Williamson looks back at the origins of the Musicians’ Union, on the occasion of its 120th anniversary last month. 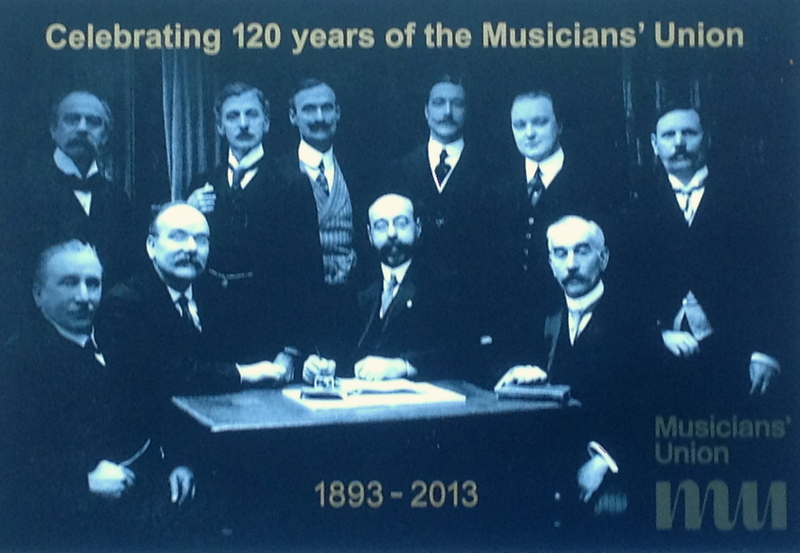 It was 120 years ago today (7th May 1893) that the Manchester Musicians’ Union, the predecessor of the Amalgamated Musicians’ Union and the Musicians’ Union, was formed by the first leader of each, Joseph B. Williams. While details regarding the early days of the Union are unsurprisingly sparse, there is, nevertheless, a trail of documents, which give some idea of the motivations and early activities of the Union. Many of these were collated in a series of articles for The Musicians’ Journal in 1929, by the then General Secretary of the Musicians’ Union, E.S. Teale. He also concedes that “the only person in possession of the knowledge necessary” to provide an early history of the Union was Williams, who by this point was suffering from ill-health and living in France. Unfortunately, Williams never wrote such an account. In addition, Teale highlights the lack of written documentation from the first year, noting that “minutes for the first two years are very meagre and no monthly publication was issued until 1895.” This makes untangling the sequence of events during these years somewhat tricky. Nevertheless, there is sufficient material in the Union’s archive to establish some of the undisputed facts regarding the formation of the Union and to place them in the industrial context of the time and the attempts of workers (generally) and musicians (specifically) to organise. Throughout the nineteenth century, trade union activity had been either outlawed, or severely restricted by a range of legislation, stemming from the Combination of Workmen Act in 1825, though the growth of large industrial workplaces made it easier for workers to organise in the later part of the century. This, coupled with the economic upturn in the late 1880s and what Clegg et al describe as an increasingly widespread “acceptance of socialism” (1964: 89) led to the birth of “new unionism,” a revival of increasingly militant and effective Unions in the late 1880s. This was epitomised by the London Dock Strike of 1889, a landmark success for an organisation of largely casual and poorly paid workers. Previous Union activity had tended to be centred around craft unions, which were predominantly made up of skilled workers, but here musicians found themselves in an awkward position: they were the embodiment of a ‘craft,’ but there were many in the profession long after the formation of the AMU who considered trade unionism to be unbefitting of the profession. In addition, the nature of being a musician meant that outside the orchestras, there were few large groupings of workers, with many enjoying a more itinerant lifestyle, working in a range of different places with a number of different employers and colleagues. For example, many city based musicians in the 1890s moved to seaside resorts to play for holidaymakers during the summer seasons. This, inevitably, made musicians difficult to organise. There were, however, a number of attempts to do just this prior to the advent of the Williams’ union in 1893. Musicians in Birmingham formed the Birmingham Orchestral Association in 1874, which was dissolved four years later. More significantly, the London Musical Artists’ Protection Association provided inspiration for a Manchester based version of the same organisation,the Manchester Musical Artists’ Protection Association, which acted independently from London and managed its own funds. This short lived organisation was formed in 1874 and had a committee made up of one representative from each of the main orchestras or employers in the city, though it disbanded in 1876 along with its London equivalent. The handwritten minutes of the MMAPA from the 1870s represent the oldest items in the Musicians’ Union archive. Teale recognises the importance of the MMAPA in the formation of the Manchester Musicians’ Union. An accident of geography meant that Williams had been in contact with many of the what Teale describes as these ‘pioneers’ of the organised labour within the music profession. Elsewhere, there were a number of other organisations for musicians, though these tended to concentrate on either benevolent /mutual aid functions (for example, the Royal Society of Female Musicians and the Glasgow Society of Musicians) or as a means of inferring professional status or recognising technical proficiency (notably the Professional Society of Musicians which was formed in 1882 and renamed the Incorporated Society of Musicians some ten years later). While these showed evidence of musicians organising, predominantly in the largest cities, membership was restricted and none of these organisations wished to be tarred with the brush of trade unionism. However, in 1893 and just prior to the formation of Williams’ union in Manchester, there was evidence of other activity among theatre musicians around the country, most notably in London and Birmingham. The London Orchestral Association, which, while not a trade union, quickly became an important voice for London musicians, was formed early in the year, with over 1000 members joining during 1893. Williams’ early attempts to amalgamate with the LOA were to be rebuffed, although the successors of both Williams’ union and the LOA did eventually merge in 1921 to form the Musicians’ Union. Likewise, a meeting of musicians was held in Birmingham on 17th March 1893 to form a Society under the chairmanship of Sam Tute, but this was unnamed and subsequently joined forces with the Manchester musicians. Gentlemen, The phrase “WE OUGHT TO HAVE A UNION” is often uttered by musicians especially when they are compelled (for want of society) to rehearse etc without remuneration. Unfortunately, with the phrase the matter drops. No-one seems inclined to start a Union, yet on all sides it is admitted that one is necessary. (a) No member must send to any engagement a non-member. (b) No member must send an Amateur member as a deputy if a Professional is disengaged (c) No Amateur will be able to take a regular engagement. All rehearsals for productions of Operas, Pantomimes &c must be paid for (after the first rehearsal) as morning performances. If the rehearsal takes place in the evening, full salary must be paid. Members of an orchestra attending when called for a morning performance must be paid, whether the performance takes place or not. Any member accepting date or promising to deputise for another member, must do so, unless he gives 3 days notice in writing of his inability to attend. The original name of the Union was the Manchester Musicians’ Union – it is unclear when exactly it became the Amalgamated Musicians’ Union from the existing records, though it would appear to have been either at or around the time of the first meeting. Teale notes that Tute’s Birmingham Society had called itself the AMU in June 1893 and had questioned Williams over who was first to use the name. Teale speculates that this may have been because “some of the musicians in Birmingham received one of JBW’s ‘Anonymous’ circulars and called a meeting of musicians to discuss it before the Manchester musicians could get together” (1929: 6). It is impossible to tell how plausible this is, suffice to say, that it suggests that the Manchester musicians had adopted the name prior to the Birmingham ones in June 1893. However, this seems slightly at odds with other accounts. The Union calendar of 1917, which marked the key dates in the Union’s history lists the Birmingham branch as not opening until 1894, which would have tied in with a visit of Williams to Birmingham, when he argued that the Union should “avoid the mistake of splitting up Branches as was being suggested instead of making one Union for the country” (EC minutes, 25th February 1894, quoted in Teale, 1929: 6). He also persuaded the Birmingham musicians that the Union’s General Office should be Manchester and not Birmingham. Regardless of the date of adoption of the AMU monicker, Williams wrote of it: “we adopted the title for the Union, “Amalgamated Musicians’ Union” as kind of compliment to the other Unions, with whom I was in close touch at the formation of the AMU” (ibid). 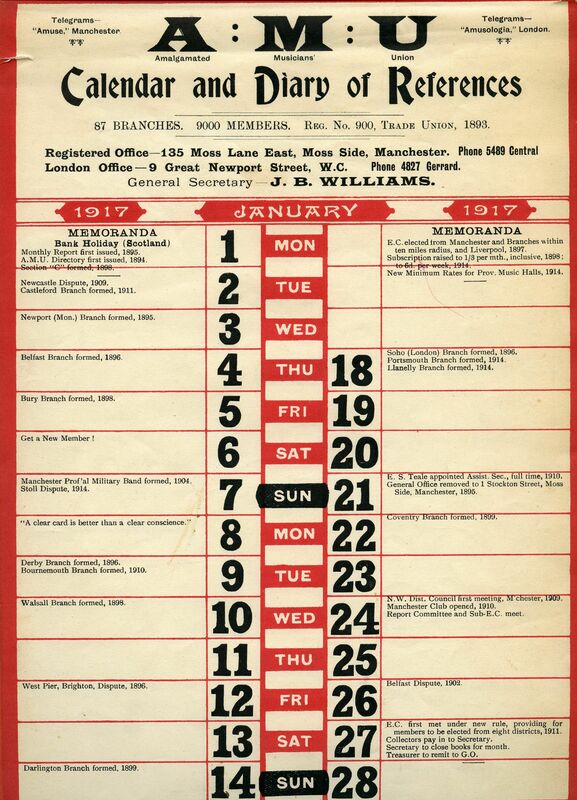 The 1917 calendar, however, in its header, notes that the Union was registered as the AMU in 1893, so it would appear that the name was adopted on, or immediately after, the initial meetings. Allowing part-time and amateur musicians to join initially set it apart from other musicians’ organisations and was the fundamental disagreement between the AMU and LOA in their early years. Clearly, Williams’ initial view was that having amateurs in the Union would strengthen it and limit their impact on ‘professional’ musicians. Much of the Union’s activities in the early years were based on trying to get employers to agree to the type of standard terms and conditions of employment that had never been achievable in the past. This was to be a lengthy campaign, not helped by the huge number of different environments in which musicians of the 1890s found themselves performing (and the attendant number of different employers). In these little documented first months of the Union, there is still much evidence to suggest its initial success. By the end of 1893 it had 1093 members, a year later 2421 and by the end of the decade, 3626. Branches were formed around the country: Dundee was the first (on 8th June 1893) and Glasgow, Liverpool and Newcastle had all formed branches by the end of 1893. Gradually, over the course of the following years, the Union began, at the behest of Williams and his mother (with Teale as Assistant General Secretary from 1896), putting in place the infrastructure that was to see it both survive and grow becoming increasingly powerful as its membership grew. The first General Meeting of the Union was held on 29th October 1893, and proposals were put forward to affiliate with the London Orchestral Association, an offer which, as noted earlier, was rebuffed by the London musicians. The first AMU Congress took place in November 1894 in Liverpool. By this point the Union had 19 branches, a cash balance of over £1000 and 2250 members. An Executive Committee was formed, meeting for the first time on 9th December 1894. Its agenda highlighted some of the issues expected of a new Union – the election of a committee, appointment of a solicitor and a vote on who was to chair the Executive Committee. It also set out the intention of the Union to produce a directory and monthly report, both of which were to form an important part of the Union’s communication with its members. Teale describes the first years of the Union as “getting together the framework of the administrative side of the organisation, forming Branches, getting an EC together, appointing Trustees, and deciding on Rules, while questions of policy were generally decided by the General Secretary” (1929: 5). This perhaps neglects to mention Williams’ increasing involvement in both disputes (for example, at the Rosa’s Court Theatre in Liverpool in 1894) and court cases (such as DeBanzie vs. Vollmer in Glasgow, 1895) which increasingly took him out of Manchester, involving himself in the resolution of disputes and encouragement and formation of new branches. Nor was this was not an entirely smooth journey. Teale recalls how Williams’ was “challenged by a few malcontents,” mainly orchestral musicians who resented what he refers to as “”an EC composed mostly of Music Hall and Theatre musicians, plus what was considered to be a boy General Secretary in an inferior orchestral position.” This came to a head at a special Delegate Conference in Leeds in 1895, when Williams won the support of the Union’s executive committee in a dispute with the Manchester Branch. So, despite the internal problems, and the geographically limited nature of the early AMU, which was heavily focused on the North, it is easy to underestimate Williams’ tenacity and perseverance in organising a disparate group of workers with often conflicting interests under the umbrella of a trade union. Indeed, such was the growth of the Union, his assessment, in the first issue of the AMU’s Monthly Report in January 1895 that “the progress of the Union during the past year has been in the highest degree satisfactory,” was one of understatement rather than self-congratulation. AMU Monthly Report – various editions, 1895. The Musicians’ Journal – various editions 1929, 1930. Clegg, H, Fox, A, and Thompson, A. 1964. A History of British Trade Unions since 1889. Oxford: Clarendon Press. Teale, ES (1929) The Story of the Amalgamated Musicians’ Union. This entry was posted in Blog, History and tagged AMU, Manchester, Manchester Musicians' Union, MU, Musicians' Union by Live Music Exchange. Bookmark the permalink.